Unleash your “inner scientist!” Learn how easy it is to capture an exciting star spectrum using just just a standalone DSLR, or telescope with video camera or FITS camera. In the video below, Senior Sky & Telescope editor Dennis di Cicco talks with Tom Field of Field Tested Systems about the growing number of amateur astronomers doing backyard spectroscopy with simple equipment. “Most amateurs are astonished at how easy it is,” he says. Field also demonstrates his RSpec program, which transforms the image of a spectrum (including real-time video images) into a calibrated graph showing spectral features. I want to make a confession to you. When I started doing spectroscopy almost ten years ago, I didn’t know most of the science you’ll see further down this page. I’m being quite honest here. I was a visual observer and imager. But I hadn’t really read up much on the stars. But, what I found was that when you capture data yourself, it has added meaning. You care about it. You go out and look things up on Wikipedia. You begin reading elementary books on the topic: link. And, best of all: you start actually remembering what you’ve read because you’ve got data on it! Don’t let this stuff intimidate you. If I can understand this stuff, so can you! 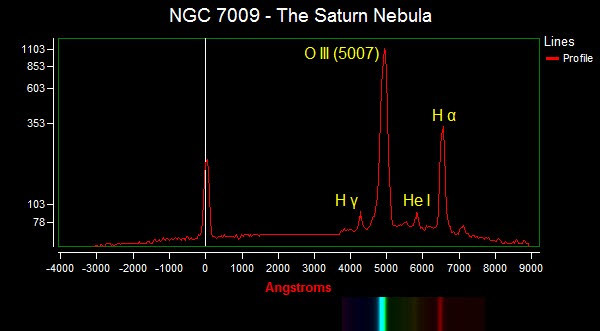 For me, spectroscopy has opened up a much deeper dimension to astronomy. It can do the same thing for you! Have questions? Get answers from me using our live chat or contact form: link. The page below shows some examples of the kinds of projects that can be done with a low resolution diffraction grating, like our Star Analyser or the Rainbow Optics Star Spectroscope. With one or two clicks in our RSpec software, you can convert a standard FITS, jpg, RAW, or video image to scientific data like that below. 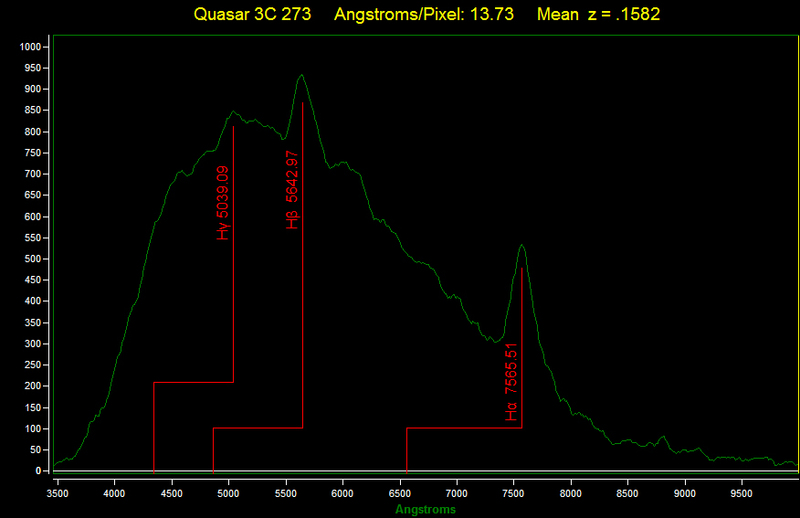 Spectroscopy has finally become accessible to amateurs! You can post questions about these projects on the RSpec Yahoo forums (link) or email us via our contact form (link). Below is a sample of some the excellent work done by Torsten Hansen, using a Star Analyser grating, an 8″ Newtonian, and just an astronomical video camera. 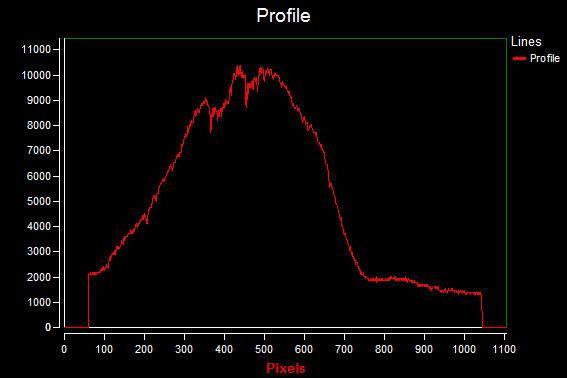 If you have a FITS camera or DSLR, you can easily capture this kind of data and much more! Each row in the table below is a different star. 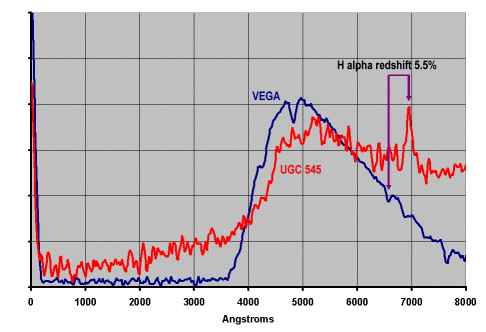 Also notice below, for example, that the Hydrogen Balmer (beta) absorption line at 4861 Angstroms is the strongest for the Type A star. This particular Hydrogen transition isn’t as prevalent in the hotter or cooler stars. See? There’s lots to learn from such easy-to-capture data. And, if it’s data you captured yourself, you’ll be amazed at how much easier it is to learn and remember! Detect the Emission lines on an Emission Nebula: An emission nebula is surrounded by a gas shell that is excited (like a florescent light). 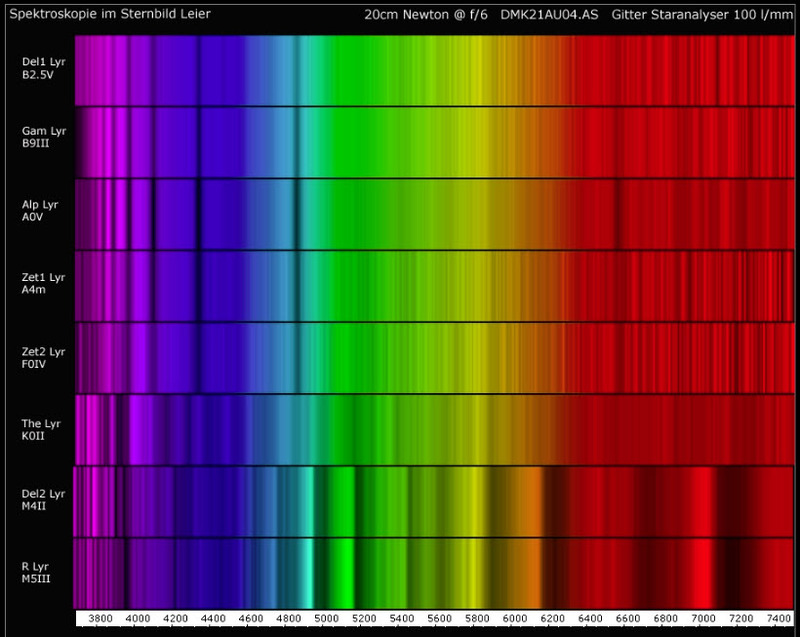 Below is a spectrum of the Saturn Nebula clearly showing its emission lines. The Orion Nebula (M42) would have a similar appearance. Emission lines of a distant nebula! Emission lines of a super-giant star! Detect the Methane atmosphere in Neptune or Uranus: The image below by Paul Tervit shows the absorption by Neptune’s atmosphere. You can capture Neptune’s spectrum with an 8″ scope, a FITS or astronomical video camera and our Star Analyser diffraction grating. Also, see link for an interesting write-up on Uranus included an RSpec spectrum. “This link has a very interesting transcript of an interview with Maarten Schmidt, the discoverer of this first quasar. It’s exciting and fun to read such a personal account by a world-known professional. Measure the redshift of galaxies with a Star Analyser! Want to measure the red shift of a galaxy? The image below shows the spectrum of Seyfert Galaxy UGC 545, a mag 14.1 galaxy with an Active Galactic Nucleus. Not all galaxies are suitable for this measurement with a Star Analyser grating. The high luminosity of this galaxy’s core makes it visible despite being at a significant distance from us. And the compact, almost stellar appearance allows our Star Analyser diffraction grating to be used. Credit: Robin Leadbeater, 8″ telescope and just a webcam! Link. Wolf–Rayet stars are a normal stage in the evolution of very massive stars, which continually eject gas into space, producing an expanding envelope of nebulous gas. Notice the wide Carbon emission bands! Their width is attributed to the Doppler effect because the gas surrounding these stars is moving with velocities of 300–2400 km/s along the line of sight. Yes, it doesn’t take a ton of gear, skill, and dark skies to capture fascinating spectra like this one! It’s images like this that we find so enormously exciting. P Cygni is a Blue Supergiant and is one of the most luminous stars in the Galaxy. It is famous for the characteristic spectrum line profile which bears its name — an emission line paired closely with a blue shifted absorption line. 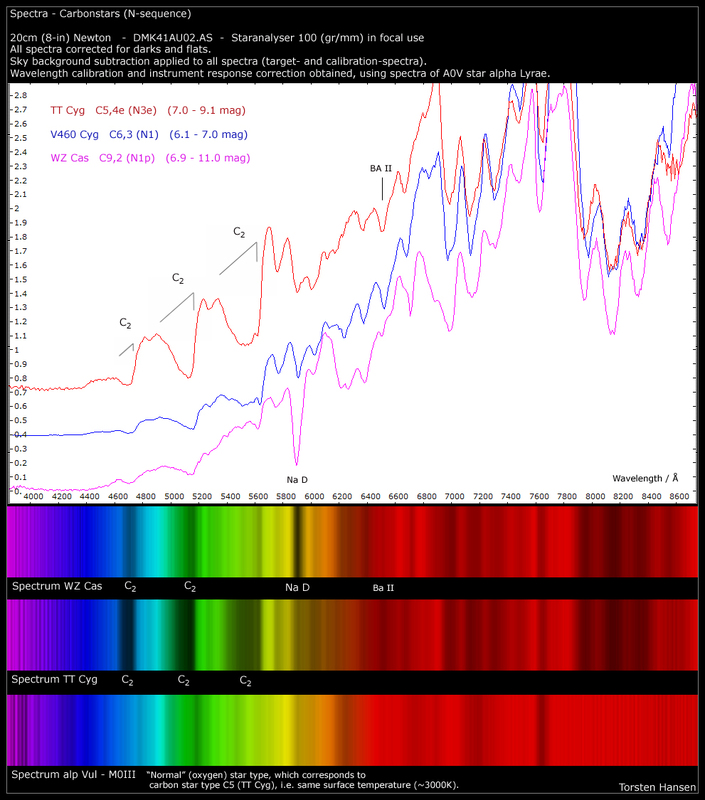 Emission lines due to Hydrogen and Helium can be identified. The characteristic P-Cyg blue shifted absorption bands are not resolved however at this low dispersion. (A dispersion at least 5x greater would be needed.) Credit: Robin Leadbeater using a webcam, VC 200L and Star Analyser (link). Solar Spectroscopy: If you work with the sun, you can have fun doing astronomical spectroscopy and still get a good night’s sleep! Use a ball bearing or a sewing needle with a dark backdrop to get a spectrum of the sun. Be careful of your eyes. Never look directly at the sun or its reflection. Changes in a variable LL Lyr star: This wonderful animation is just one evening‘s worth of images. Done by Umberto Sollecchia in Italy with just a 110mm refractor and our Star Analyser grating. 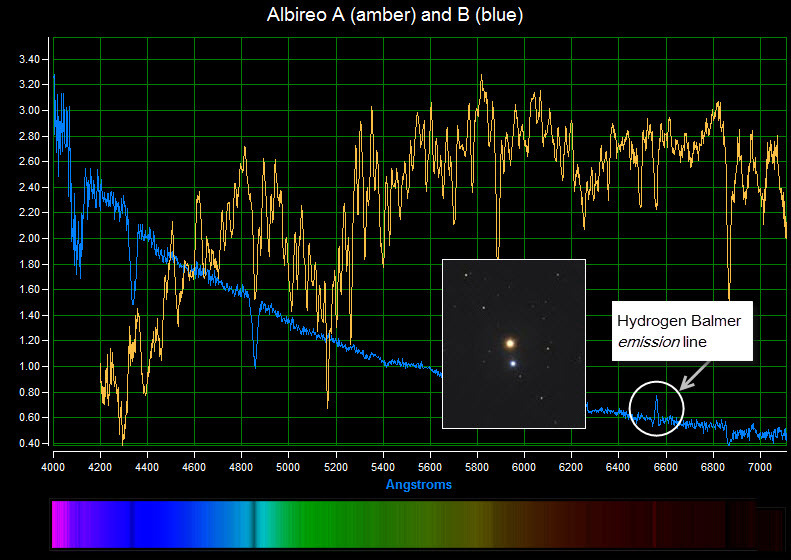 Watch how the temperature of the star changes and how the Hydrogen beta line (at 4861) and others come and go! This amazing and exciting animation by Mr. Sollecchia shows the exciting kinds of observations that can be made by amateurs with small telescopes. Supernova: Below is a wonderful spectrum of a supernova imaged by David Strange in the UK. The deep absorption marked as Silicon II is an indicator that this is a Type Ia supernova. At the time he took took this image and created the profile, David had been using RSpec for just over a week. 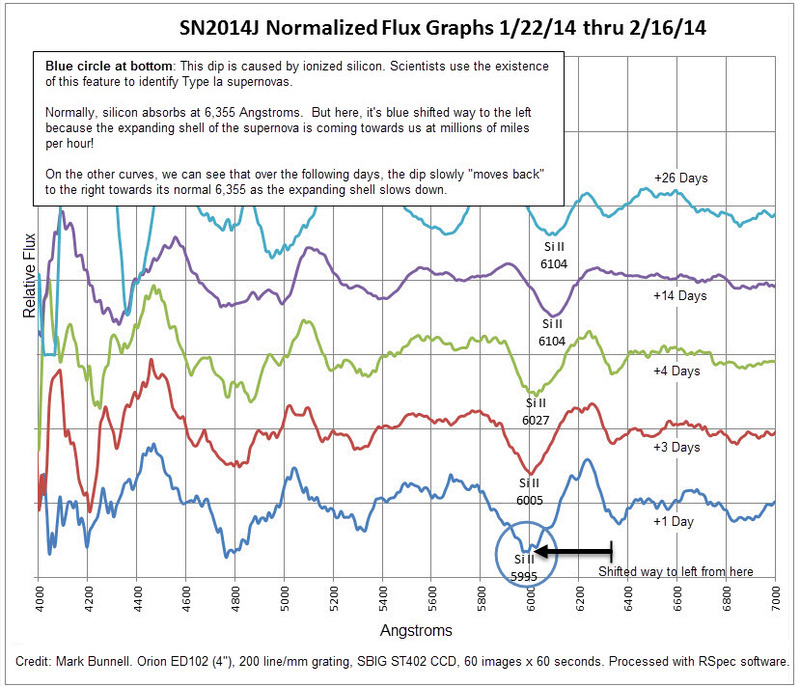 What continually amazes people is how little integration time is needed to capture spectra. 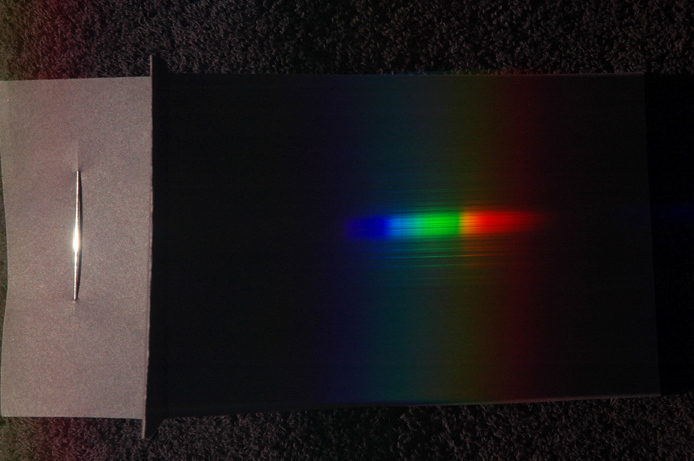 This spectrum was captured on a 9″ SCT, with only 30 twenty-five second images! We’re not talking about hours of integration time here, nor large aperture. Dark sky sites aren’t required either – spectroscopy is considerably less affected by urban light pollution than visual imaging. To download the original FITS image that was used to create the above profile (courtesy of David Strange), right-click this link. To view a video that discusses how the above spectrum was calibrated, click this link. 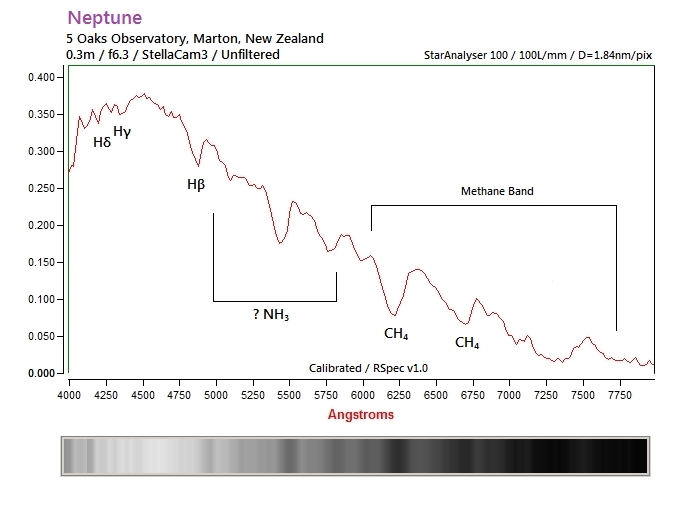 A final comment on the above spectrum and calculation: this is jaw-droppingly exciting stuff. 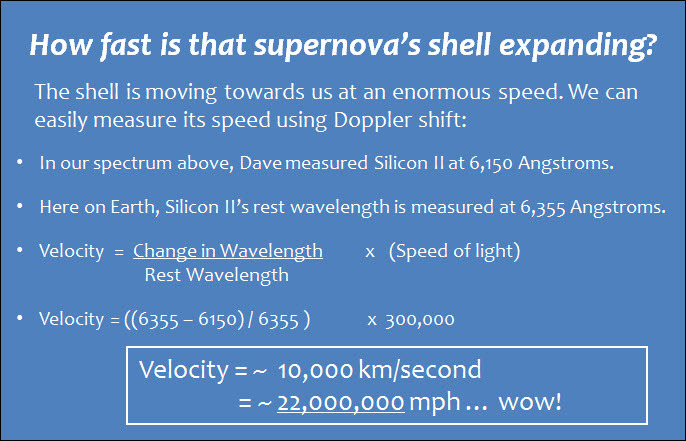 Imagine: a backyard telescope measuring the Doppler shift of a supernova! Observe the changes in a supernova over a few weeks: Below is a a series of spectra taken of a recent supernova during the days and weeks after the event. These were taken with just a 4″ refractor! Here’s the full description (pdf) as it appeared in Sky & Telescope Magazine: link. Nova Spectrum: Below is the spectrum of Nova Del 2013. Alfred Tan captured this image in Singapore, using his just 90 mm Williams Optics APO and an Imaging Source astronomical video camera. 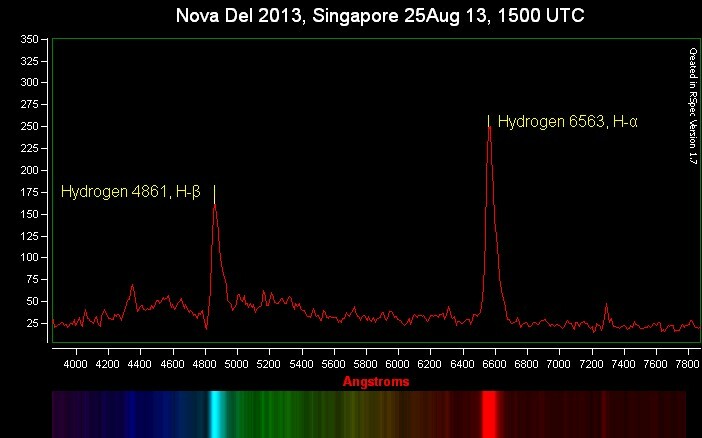 The Hydrogen emission lines are very clear and typical for this type of nova. Study Nova Evolution: Below is a poster that was presented at the 2014 American Astronomical Society meeting. 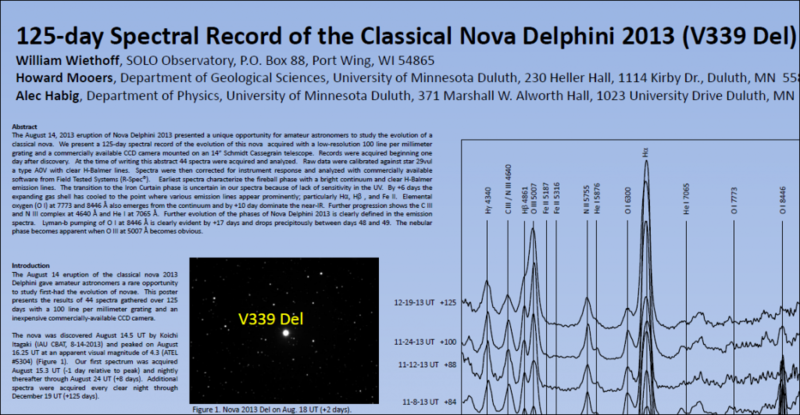 Using a Star Analyser grating and RSpec, a team at the University of Minnesota captured 44 spectra of Nova Delphini 2013 over a period of four months. Major phases of the nova evolution can readily be identified. Click on this link to download the complete poster. 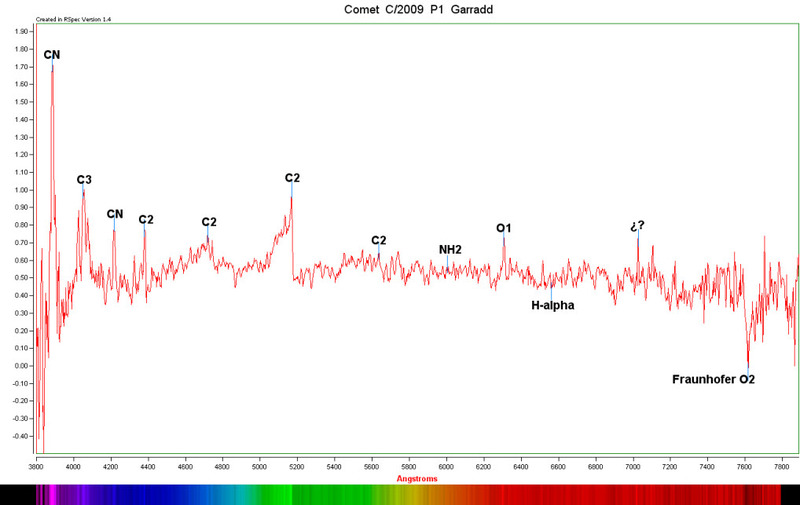 Carbon Stars: Below are some wonderful image spectra showing the C2 Swan bands on several Carbon stars. Notice how much stronger the signal is in the right-hand, red end of the spectrum. Read more about Carbon stars at this Wikipedia link. Credit: Torsten Hansen with just a 20 cm (8″) telescope, a Star Analyser grating, and an astronomical video camera. Gas Tube spectroscopy: You don’t need to buy a telescope or expensive grating to do spectroscopy! Check out our video spectroscope: link. Flame Emission Spectroscopy: No, it’s not astronomy either, but you can do it in the comfortable indoors during the winter! Check out our video spectroscope: link. The final portion of the video there shows how you can easily do flame spectroscopy! Do you have an spectrum we could post here? 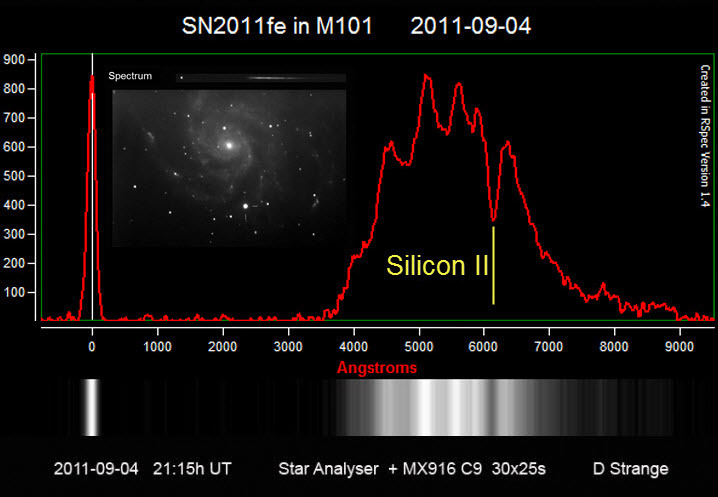 Low Resolution spectroscopy can also be used to identify variable stars types, novae and the occasional bright super-novae (as shown above with SN2011fe). If you have samples of this kind of work, or other low resolution spectra of any type that you’d like to see posted here, contact us. All images used with the permission of their respective authors.